Think surfing and you probably think of sun-bleached blondes and long, wave-washed beaches of California. Or maybe the competitive curls of giant waves off Hawaiian or Australian coasts. Canadians might point to hardy, wetsuit surfers off its west coast. But have you ever considered a surfing holiday in Ireland? Thought so. Think of the Emerald Isle and your musings probably turn to cozy pubs, cobblestone streets, lilting accents or cliff side ambles. But there’s a surfing culture blooming in county Donegal on Ireland’s Wild Atlantic Way – a 2,500-kilometer coastal driving trail through nine Irish counties. Donegal resident Mary Britton visited California in the 1960s. She wasn’t just mesmerized by Californian dreaming, she watched people catching waves in the turquoise waters and thought, “we could do that!” I’m assuming she realized they’d need wetsuits for the frigid North Atlantic waters but she shipped a couple of surfboards home. She introduced her children to the new sport. Not put off by the lack of surfing companions or chilly weather, her sons shared a wetsuit and watched television to learn techniques. They began competing and Brian Britton was instrumental in developing the sport in Ireland. 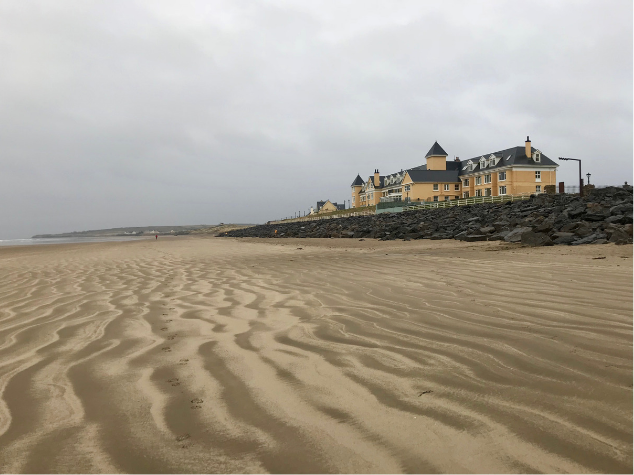 Now Mary’s grandchildren and great-grandchildren are surfing (Easkey Britton is five-time Irish National Champion) and visitors to Dungloe’s sandy beaches in county Donegal are as likely to spot someone balancing on a surfboard as a flock of oystercatchers. At the Sandhouse Hotel & Marine Spa large windows provide direct views of the wave-washed horizon. Steps away a fine sand beach offers kilometers of beachcombing. In the pub surfboards compete with Guinness signs for wall space as barkeeps pull a foaming pint of lager. And if you’re not a surfer? The juxtaposition of surf and traditional Irish culture take a few minutes to wrap your mind around but then you realize it’s why we travel. Those unexpected discoveries at the end of the road reshape our worldview and make one wonder, “When’s the last time I found a new interest while travelling and brought it home?” Maybe it’s time to do it again. Why you’ve never heard of this surfing destination – Click to Tweet. Where in the world is the surfing culture booming? Find out in my friend @Reinventure’s blog post here: Click to Tweet.